If you’ve been feeling at loose end since the end of the Commonwealth Games, don’t worry, there’s lots of exciting stuff still happening in the city. 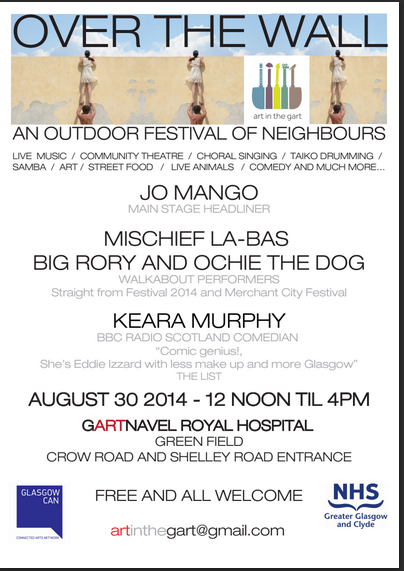 A good place to start this Saturday 30 is at Gartnavel Royal Hospital. As part of their Art in the Gart programme, they’re running “Over the Wall”, which they describe as an outdoor festival of neighbours. The festival runs from 12-4pm and includes the brilliant Jo Mango as a headliner, as well as Taiko drumming, choral singing comedy and street food. All in all it looks like a great day for all ages.